I had tickets to see "the owl movie" last night (aka "Legends of the Guardians: The Owls of Ga'Hoole") but when I won tickets from The Oakland Press to see "You Again," I of course decided to see that instead. The trailer looked funny and it was a movie I had been wanting to see for a while. The movie was cute overall, but unfortunately after starting out very funny, the humor level deteriorated during the rest of the film. 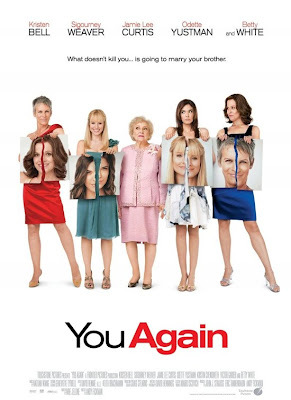 Marni (Kristen Bell, "When is Rome") is flying home for her brother's wedding, when she finally hears from her mom (Jamie Lee Curtis, "Beverly Hills Chihuahua") whom her soon-to-be sister-in-law is: Joanna (Odette Yustman, TV's "October Road"), aka JJ, aka Joanna's "arch nemesis" from high school. Needless to say, even though it has been eight years since she graduated, she is not too pleased about this, and it gets even worse when she meets Joanna, who pretends not to remember her from high school, going as far as to say "It's great to meet you!" Marni tries to tell her brother Will (James Wolk, from the Hallmark TV movie "Front of the Class") how evil Joanna is, but he refuses to believe her. Marni soon realizes that she's going to have to take matters into her own hands before Will marries Joanna and ruins his life forever. Things get even more complicated when Joanna's Aunt Ramona (Sigourney Weaver, "Avatar") comes to town for the wedding; Marni's mom realizes that they went to high school together, and indeed were even best friends up until their senior year prom. The two actresses who stole the show, in my opinion, were Betty White (TV's "Hot in Cleveland") as Marni's Grandma Bunny, and Kristen Chenoweth (TV's "Pushing Daisies") as Georgia, a famous wedding planner who is also a bit crazy. Unfortunately, we don't see nearly enough of these two actresses throughout the film. There's also a brief, unexpected cameo by Dwayne "The Rock" Johnson ("The Other Guys"). In addition, Victor Garber (TV's "Eli Stone") plays Marni and Will's dad, and the very cute Sean Wing (TV's "South of Nowhere") plays Charlie, Will's best friend and the guy that Marni had a major crush on when they were in high school together. An interesting fact for Michigan residents like myself, too, is that Kristen Bell is originally from Huntington Woods, MI, and James Wolk is from Farmington Hills and attended the University of Michigan's drama school. Between Bell, Garber, Jamie Lee Curtis, Sigourney Weaver and Betty White, we have a lot of A-listers here; unfortunately, in my opinion, the movie did not live up to the full potential of its stars. Maybe see this movie. The first third or so started off very cute and I thought it was going to be great; however, it soon started dragging, and the jokes became fewer and far between. The ending is a bit bizarre but works, I suppose. Odette Yustman is believable as the "mean girl" that tormented Bell's character in high school, but when it comes to her "born again nice girl" act, I didn't really believe it; she spends the last half of the movie crying and trying to be dramatic and it was almost painful to watch. If you're looking for a fluff film that is cute, though, "You Again" might be the movie for you. "You Again" will be in theaters this Friday, September 24th.